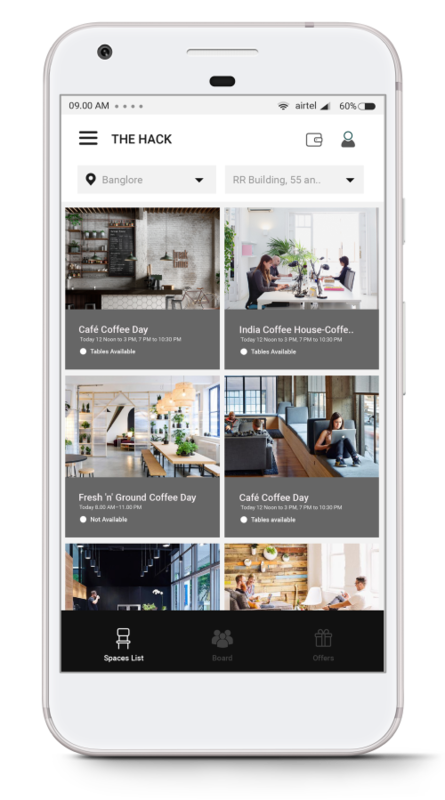 The Hack lets you work from cafes, pubs & coworking spaces with the tap of a button. Work from a new place everyday without any rentals! Download the The Hack App! The freedom to book a coworking space or cafe to work out of is here! Download The Hack App! Work, Eat, Drink & Network - Just Download The Hack App and Start Working! The Hack lets you work out of cafes, pubs and dedicated coworking spaces with the tap of a button! Download our app and book your ideal location and start working. At every Cafe or Pub you will find high-speed WiFi, Power sockets exclusive to The Hack members. Don't forget to redeem your food and beverages coupon. If that's not your cup of tea and you are looking for something more professional and engaging, we have a lot of dedicated coworking spaces too! Just head over to Play Store or App Store and download the The Hack Workspaces app now! Redeemable Coupons And Member Only Discounts. Enjoy the flexibility of choosing a different space every day. We’re currently in locations across the Banglore areas, with more cities coming soon. One Visit to Any of the HACK locations. 10 Visits to Any of the HACK locations. 30 Visits to Any of the HACK locations. Unlimited access to all HACK locations. Corporate Credits for Your Entire Staff.